Accidents happen! From cracked screens and cases to broken internal components. Liquids don’t mix with electronics. All it takes is one drop to short–circuit a device. And full immersion – like in a pool or cup of coffee – often equals disaster. If your battery can’t hold a charge or drains too quickly, we’ll replace it. If you ever have problems with the screen, buttons, or internal components, you’re covered. You get 2 years of accident protection for your Kindle at a price that is about 40% less than what you would find at other bricks-and-mortar retailers. In the first 90 days, you may cancel for a full refund. After that, you are reimbursed the unused part of your Protection plan. For example, if you cancel your 2–year Protection plan, after 12 months with no claims, you’ll get 50% of your money back. If you sell or gift your Kindle, you can transfer your warranty at no cost. Upon warranty purchase, you will get an email. This is your official confirmation of a purchase. A welcome kit will also be sent via mail (for pre-orders, we will send the Welcome Kit after your Kindle ships). So as to offer an efficient customer experience, SquareTrade may also contact you about your purchase by telephone. Please read the terms and conditions from the link on this page. There is also a link to an easy to understand Service Agreement Summary. Warranty lasts two years from Kindle ship date. 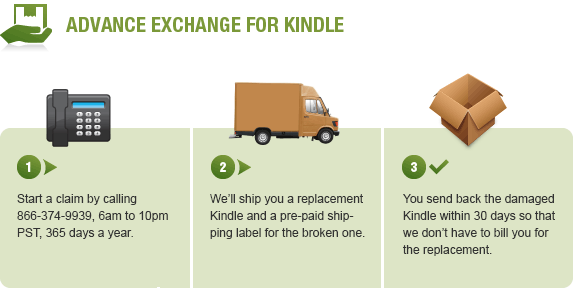 Your warranty plan begins on the date your Kindle shipped and is inclusive of the manufacturer warranty period. Warranty lasts 2 years from the purchase your warranty and is inclusive of the manufacturer warranty period. It will begin after your purchase your warranty. Warranty lasts 2 years from the date your warranty starts and is inclusive of the manufacturer warranty period. Your warranty will start shortly after your device is expected to ship. For items that are delivered late, call SquareTrade to extend your warranty plan to the actual shipping date. For toll free assistance please call 866-374-9939, 6am to 10pm PST, 365 days a year. An agent is always happy to assist you. Moshi iVisor XT (HD clear) No-Bubble Screen Protector for the All New Kindle Fire HD 7"